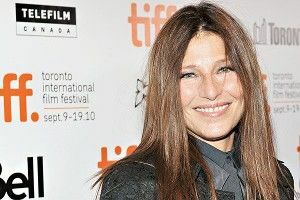 Here’s one to get preemptively psyched on: Deadline is reporting that Charlie Kaufman is writing and directing an HBO comedy, and that this Charlie Kaufman-written-and-directed HBO comedy will star Catherine Keener. The untitled show, which is now being fast-tracked by HBO, is “an exploration of one day in a woman’s life and how the events leading up to it can affect, or not, the reality in which she lives.” What does that mean, exactly? Will a whole season take place over the course of one day with flashbacks and digressions, kind of like Nicholson Baker’s awesome 1988 novel The Mezzanine (the whole book is one guy’s escalator ride up to his office)? Or are we talking more Sliding Doors-style alternative reality action? Wait: will this be a groundbreaking melding of Gwyneth Paltrow and Nicholson Baker?! OK, and are we now just unnecessarily speculating based on very little information?!! Let’s focus on the concrete, then. Kaufman and Keener have a fruitful collaborative track record, with the actress having appeared in the Kaufman scripted Being John Malkovich — in which she just utterly slayed, as the coldhearted temptress Maxine — and Adaptation (briefly, as herself), as well as in the Kaufman directed Synecdoche, New York. She’s also on board for Kaufman’s next one, Frank or Francis, a Hollywood satire in which an uppity Oscar-nominated director feuds with a jerk movie blog commenter. There’s no real clear indication as to when that will happen, though; the last we heard from Kaufman was when his novel was announced. If HBO is running around fast-tracking things, it is safer to assume the Kaufman/Keener show will hit the world before the next Kaufman movie? Well, let’s not forget that even this level of critically-acclaimed collective power is no sure thing for a series pickup. It was only weeks ago that Jonathan Franzen, Ewan McGregor, and the rest of The Corrections crew got crumbled up and thrown away like a parking ticket. Anyway, this, tentatively, exists. Act accordingly. The Top 10 Songs in ... HIP-HOP AND R&B!